Bring Elsa home to your little girl with this pink Elsa bow. This will sure to be a frozen favorite! 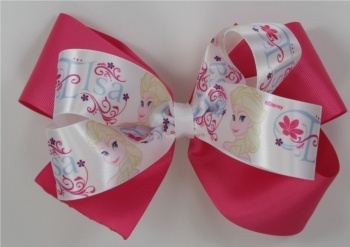 Double layered with a picture of Elsa and Elsa's name written in script on a satin white bow. This is on top of the 2.25 grosgrain pink ribbon and wrapped with a white 7/8 inch grosgrain ribbon.